After 15 months as East Village's police commander, Judith Martin says she was "naive" about the rigors of the job when she was introduced to East Village Association members in June 2008. But she appeared no less frank in a return question-and-answer session. 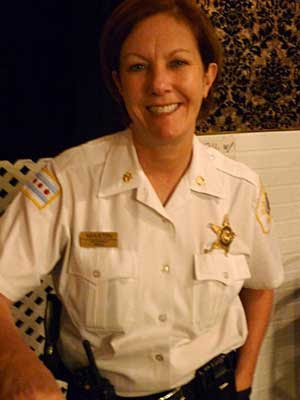 Guest Speaker was Commander Judy Martin with the 13th District Chicago Police Department. Commander Martin presented a brief update on crime in the East Village neighborhood and the 13th District. Commander Martin stated that for the most part, crime is down about 11-12% since June 2008 and that homicides are less than 200 for the year to date, which has not been the case since about 1965. She mentioned that the East Village neighborhood and the 13th District predominantly suffer from property crimes and have several “frequent fliers” in the area who continue to be caught and then re-offend. Commander Martin presented a Community Alert handout regarding an armed robbery and mentioned a CPD sponsored “Safe and Sound” program that presents information about why someone may become a victim. A handout provided key safety tips. Auto theft is related to the higher number of people coming into the area for entertainment. CPD is using a parked car as bait for thieves. Commander Martin explained that when someone tries to break into and steal the bait car the doors lock and it won't start, leaving the person locked inside until police arrive. Other crime-fighting tactics include a footman that walks the streets from Ashland to Webster in the afternoons, a bike team and the use of all-terrain vehicles. CPD has its own site similar to Twitter but more secure called Nixle, where people can receive up-to-date information from CPD. Commander Martin also informed EVA group about a new ordinance regarding what she called “dooring.” When a biker is hit by someone opening their car door, it is now illegal and that person who opened the car door can be issued a citation. When asked about budget cuts, Commander Martin stated that she has yet to lose any officers other than 7 crossing guards. She mentioned that she is, however, taking 12-15 unpaid furlough days. When asked about outdoor patios and beer gardens in the area, Commander Martin stated that they are allowed to be open until 11 p.m. on weekdays and until 12 a.m. on weekends. However, no music is permitted. A handout was also provided regarding that issue. Aug. 3 is the annual EVA BBQ. John Scheer stated that EVA has Dominick's gift cards to help out with food and supplies but that The Boundary will be providing the burgers and cooks for the BBQ. Also, Piccolo will be providing gelato for the event. 1041 W. Damen Ave. which is a special use building with 6 units went to the zone of appeals to estabalish a dwelling unit below the first floor. EVA was not notified of this variance. 1726 Augusta is already under demolition. 1546 W. Augusta is currently up for demolition but has no permit left. Mr. Rappe is asking that emails be sent to alderman Burnett in opposition of demolition. 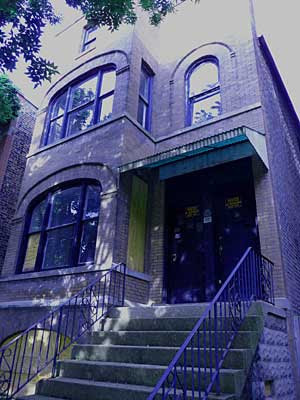 920 N. Winchester (pictured) is being rushed into demolition by Alderman Waguespack due to other neighbor concerns with the look of the building, primarily the coach house. However, Mr. Rappe and other EVA members felt strongly that there are better solutions to the problem versus having the building torn down. Again, requests for emails to be sent to the alderman asking for alternatives to the demolition.